A man and a woman who said they were Moorish nationalists claimed sovereign rights to a multimillion-dollar mansion up for sale near Washington, D.C.'s Rock Creek Park Wednesday. No one lives in the house currently, but the couple that owns the home lives nearby, and when the wife received an alert about the alarm going off, she rushed over expecting to find a real estate agent. Instead, she found a man and woman who claimed they owned the land because their ancestors were the original inhabitants. “This is our ancestral estate,” the man can be heard saying in security video. “We sent you a letter, reversal of estate, to your office,” the woman said. The man and woman can be heard repeatedly saying they were Moorish nationalists who had a sovereign right to the home. Moorish American Nationals believe black Americans are descendants of an ancient Moroccan empire. Most members are law-abiding citizens, but a splinter group believes their ancestors were here before the U.S. government so many federal and local laws don’t apply to them. The homeowner tried to keep her distance as she called police, but she grew increasingly concerned for her safety. “These are very frightening people,” she said. Surveillance video shows the man and woman breaking into the home, then taking down the for sale sign before the homeowner responded to the alarm. Once police arrived, the couple continued insisting the land was theirs. “She’s on our land,” the woman said. After more than 30 minutes, the couple became more argumentative with police, beginning to yell. Finally, the man appeared to try to push past police, who then arrested the couple. They remained defiant as they were escorted out by police. The suspects were both charged with misdemeanor unlawful entry and released pending a court date. They were ordered to stay away from the home. 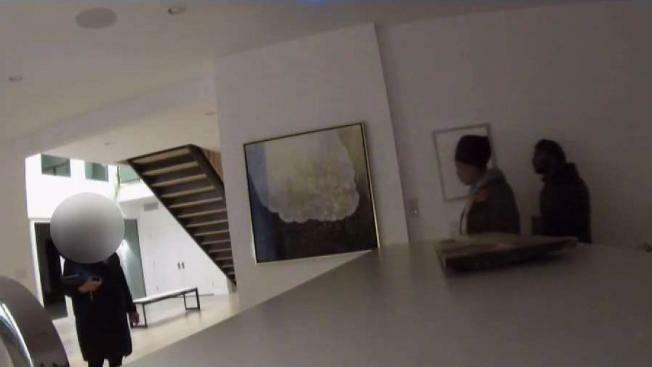 A similar incident took place in 2013 when Lamont Butler moved into a vacant mansion in Bethesda, Maryland. He said his religious beliefs as a member of the Moorish Nation entitled him to the home. The police disagreed.